Trinity Lutheran Church – A Place for You! Welcome to Trinity Lutheran Church. We are glad you are here! We strive to be a welcoming place of God’s grace where everyone is living passionately for Jesus Christ. Awakened by the transforming power of God, our mission is to engage the curious, encourage the convinced, and empower the committed to be fully devoted disciples of Jesus Christ. We invite you to explore our site to learn more. Check out our calendar for a complete schedule of services and events. Feel free to reach out to us with a prayer request or to answer any questions you may have. Please join us for Sunday morning worship. All are welcome! Please check the calendar for a full list of worship services, special occasions, and events. Do you have a passion to serve? 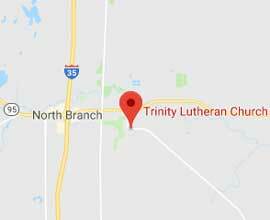 Trinity Lutheran Church in North Branch is seeking a Director of Youth and Family Ministries and a part time, seasonal Cemetery Maintenance staff member. Learn more on the employment opportunities page.